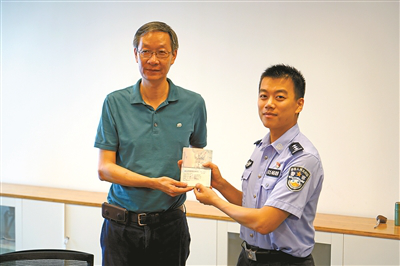 Zhang Zheng, an American Chinese expert in computer science, became the first foreigner to receive a residence permit which allows him to work part-time in the China (Shanghai) Pilot Free Trade Zone (Shanghai FTZ) on Sept 4. The new residence permit allows foreigners who are working full-time to now also take part-time work, something that was not permitted before. Zhang works as a lifetime professor at the New York University Shanghai. With the new work permit, he is now able to also take part-time jobs at tech companies to make full use of his expertise. Yu Lizhong, principal of New York University Shanghai, said the fact that Zhang can now get a part-time job is helpful for both the university and its students, and the move will help students get internships or employed at local companies, and help the university strengthen partnerships with the companies. The new permit is one of three new exit-entry policies mentioned in the Shanghai Exit and Entry Talent Aggregation Plan (2017-2021), that was co-released by the Ministry of Public Security and the Shanghai municipal government in January. The policy allows foreigners who work in the Shanghai FTZ and Zhangjiang National Innovation Demonstration Zone as well as the city’s entrepreneurship and innovation bases to take part-time jobs at institutions in the zones and bases. Foreigners can apply for the new permit once they have received approval from the relevant administrative authorities. Xi Min'ou, deputy director of exit and entry administration office of the Pudong Public Security Bureau, said that the policy lifts the restriction of a foreigner only being able to work in one institution in Shanghai, offers local institutions more options in hiring foreigners, and helps attract more talented overseas personnel to work and stay in Shanghai.